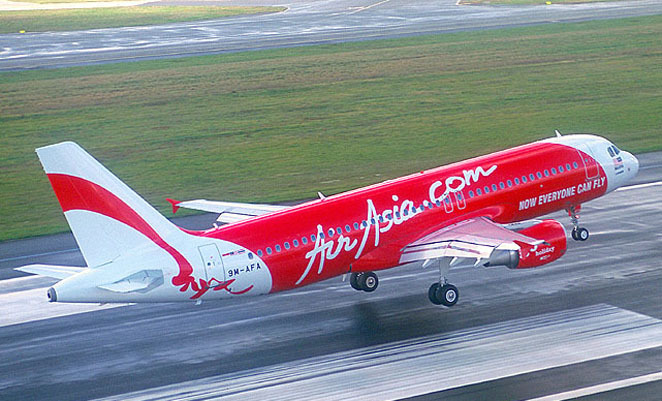 An AirAsia A320 similar to the missing aircraft. An Indonesia AirAsia Airbus A320 disappeared from radar over the Java Sea whilst operating flight QZ8501 from Surabaya on the eastern end of Java to Singapore on Sunday morning. As of Monday morning, 24 hours after contact was lost with the aircraft, no announcement had been made of any trace of the aircraft. The flight departed Surabaya at 05.27 local time, and was operated by an Airbus A320 (PK-AXC) for the Indonesian subsidiary of the pan-Asian low cost carrier. Contact was lost at 07.24 Singapore time (10.20 AEDST), with search and rescue services in Singapore and Indonesia activated shortly afterwards. The aircraft was due to arrive in Singapore at 08.37 local time, but Jakarta air traffic control reported it missing at 07.54 in the area between Pulau Belitung and southern Kalimantan. 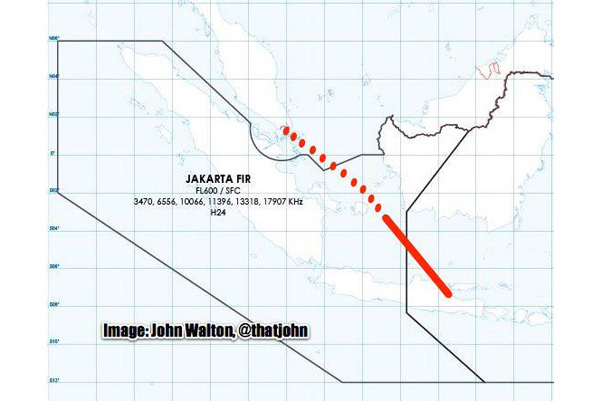 There were several severe storms on the aircraft’s planned route, and initial reports from AirNav Indonesia say the pilot had requested routing left of track and an ascent to 38,000 feet to avoid weather. The last ADS-B ping on flight tracking app Flightradar24 showed the aircraft travelling at 32,000 feet and 469kts. A China Airlines flight that followed a similar track about 45 minutes behind the missing flight also requested a re-routing left of track to avoid the weather. A passenger manifest released by Indonesian authorities indicate there were 155 passengers on board comprising 70 male adults, 68 female adults, 16 children and one infant, the majority of whom were Indonesian. The airline confirmed these numbers in a follow up Facebook post, and said there were also seven crew members on board comprising two pilots, four flight attendants and one engineer. All of AirAsia A320s are configured with 180 seats in a single class. Some media reports have drawn initial comparisons between the A320’s disappearance and that of the 2009 Air France 447 crash of an A330 in the Atlantic by suggesting while the A320 was climbing through 36,000 feet it had slowed to a less than optimal speed, but these are yet to be formally verified. An Indonesia 737-200MPA was despatched to the search area on Sunday, and the Singapore Ministry of Defence earlier confirmed it had two C-130s on standby to assist. Airbus also issued a statement on Sunday evening saying the missing aircraft was MSN 3648 and that it had accumulated about 23,000 flight hours in about 13,600 flights since it was delivered in October 2008. “In line with the ICAO Annex 13 international convention, Airbus will provide full assistance to the French safety investigation authority, BEA, and to the authorities in charge of the investigation,” the manufacturer’s statement read. An initial search of the last reported location of the A320 was conducted on Sunday night but was called off due to continuing bad weather and darkness in the area. It was due to recommence on Monday morning, and preliminary forecasts have shown an improvement in the weather in the search area. Two Singaporean naval vessels sailed for the search area late Sunday night, while Malaysia has said it will be sending three vessels. An Indonesian C-130 and a Super Puma helicopter are reported to be preparing to join the search on Monday morning. Australian Prime Minister Tony Abbott reportedly telephoned Indonesian President Joko Widodo on Sunday afternoon and offered the use of an RAAF Lockheed AP-3C Orion maritime patrol aircraft in the search. To this end, an AP-3C departed Darwin on Monday morning headed for the search area. “The RAAF AP-3C Orion aircraft has a well proven capability in search and rescue and carries maritime search radar coupled with infra-red and electro-optical sensors to support the visual observation capabilities provided by its highly trained crew members,” Chief of Defence Force ACM Mark Binskin said in a brief statement. India is also reported to have offered to send a Boeing P-8I Neptune patrol aircraft and several ships. 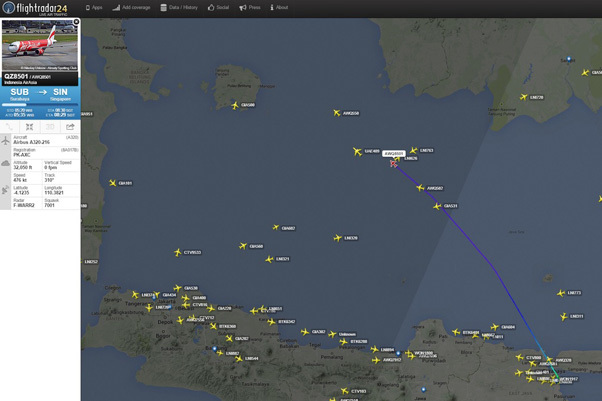 A Flightradar24 screengrab showing the missing flight and other traffic in the area at the same time. An image of the missing aircraft can be found here. As this is an evolving story, updated information will be added as it comes to hand. 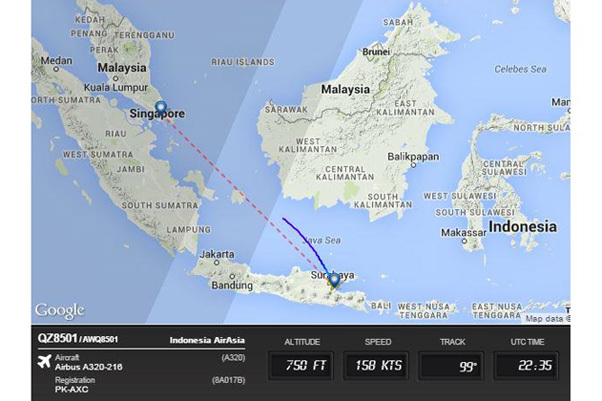 QZ8501…lost after 42 mins after take off…. You cant fight mother nature ! Will this stop me from flying……. HELL NO!!!!! Twice this year have modern aircraft vanished from radar screens with no radio call, emergency squawk code or other sign of distress being received. While the circumstances are different, the fact that it has happened should have industry safety experts scratching their heads. Things simply cannot vanish off the face of the earth. Something needs to be done sooner rather than later to prevent aircraft from disappearing without a trace.